Explore the lush countryside, Buddhist monuments, and UNESCO-listed scenic landscapes of Northern Vietnam on this 3-day tour from Hanoi. Visit the Perfume Pagoda, one of Vietnam’s most important Buddhist pilgrimage sites, and spend a whole day exploring the mountain temples. 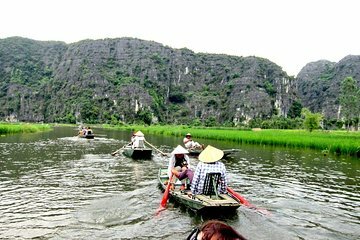 Then, cycle to the Bich Dong Pagoda, cruise around the Tam Coc Caves in a traditional sampan, and experience local life in the Kenh Ga floating village.